LineageOS 15.1 for HTC One A9 (hiaeul) is now available to download on the OFFICIAL LineageOS website. This is a step by step guide that explains how to install this HTC One A9 Lineage OS 15.1 OFFICIAL build. This OFFICIAL LineageOS 15.1 for HTC One A9 is maintained by intervigil. THIS IS AN INITIAL HTC One A9 LINEAGEOS 15.1 OFFICIAL BUILD WHICH MAY HAVE MINOR BUGS. HAVE A BACKUP BEFORE FLASHING THIS AND TRY AT YOUR OWN RISK. Installing a custom ROM may require an unlocked bootloader on HTC One A9, which may VOID your warranty and may delete all your data. Before proceeding further you may consider backup all data on the phone. You are the only person making changes to your phone and I cannot be held responsible for the mistakes done by you. – Here is the TWRP update guide for HTC One A9. This recovery guide requires an unlock bootloader on HTC One A9. Root binary is NOT inbuilt in the OFFICIAL Lineage OS 15.1 ROM, so you need a separate SuperSu package or LineageOS su binary to install to gain ROOT access on the HTC One A9 LineageOS 15.1 ROM build. 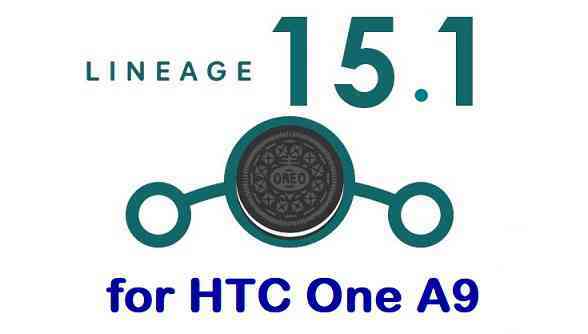 If you are on an OFFICIAL LineageOS 14.1 ROM then follow the LineageOS 15.1 Upgrade guide in the next section to upgrade to the OFFICIAL LineageOS 15.1 on HTC One A9. If you don’t have then download the recovery for HTC One A9 from above link and follow the Custom Recovery Installation Guide (it’s a generic guide which will work for TWRP as well as CWM recovery or any other recovery) provided it is in .img file extension. Download and Copy the LineageOS 15.1 Oreo GApps, SuperSU or any other ROOT package and the HTC One A9 LineageOS 15.1 ROM ZIP file to the phone or SD card memory. Reboot and Enjoy Android Oreo on the HTC One A9 LineageOS 15.1. If you are on an OFFICIAL LineageOS 14.1 (yes, I mean the Android Nougat based OFFICIAL LineageOS 14.1) then you don’t need to wipe the data and you can upgrade to the OFFICIAL LineageOS 15.1 on HTC One A9 just by cleaning the system partition. Copy the latest HTC One A9 Lineage OS 15.1 ZIP file, Oreo 8.1 GApps and/or supersu ROOT package to the phone or use the updater app to download the LineageOS 15.1 on HTC One A9. – Make sure you have a latest custom Recovery that should be able to flash the LineageOS 15.1 on HTC One A9. Reboot and Enjoy the LineageOS 15.1 on HTC One A9. If you have found any BUG on this LineageOS 15.1 for HTC One A9 then you can raise a jira ticket on LineageOS website. Stay tuned or Subscribe to the HTC One A9 (hiaeul) forum For other Android Oreo 8.1 ROMs, LineageOS 15.1 ROM, other ROMs and all other device specific topics. The first official LineageOS 15.1 NIGHTLY build for HTC One A9 will trigger on next Monday. Corresponding NIGTHLY builds will arrive on Monday of every week. I really like this page and your instruction how to do what I am on to. The biggest problem seems to be that the lineageOS downloadpage is empty or no longer existing. Do you have any idea where to download the installation files otherwise? Looks like the Lineage OS 15.1 build for HTC One A9 has been removed from LineageOS build roster itself. LineaegeOS team has strict norms to support since LineageOS 15.1, so it is possible that the maintainer of Lineage OS 15.1 HTC One A9 is unable to follow. This might have lead to the removal of the build from LineageOS build roster. The Official LineageOS 15.1 build is removed and there is no unofficial build found as of now. I hope some other user may be able to give you the ROM file!